Compared to many other security measures, roller shutters are relatively cheap to implement. Yet for that comparatively low level of outlay, they provide a very significant security boost. Criminals can’t walk through solid walls. They enter through doors and windows, and a roller shutter provides solid protection for these vulnerable points. They are difficult to get through by force, especially as they roll upwards rather than opening inwards so can’t be barged open, and they cannot easily be cut or damaged to a point that would allow entry. They also boast secure locks that are difficult to pick. Unless you have the key, roller shutters can be almost as impenetrable as the brick wall surrounding them. In short, they provide a form of security that is adaptable on almost every level, depending on what you want to get out of your shutters. Roller shutters are extremely flexible, and can be adapted in many ways to fit your individual needs. For example, they can be made and fitted specifically for the doors and windows of your premises, to provide complete and tailored protection. There are many different types available, and they can be opened electrically or manually depending on your preference. They can even be aesthetically adapted to the needs of your home or business. With a range of colours available, you can choose one that will complement the look of your home or maintain the appearance of your company’s brand. In the security world, prevention is definitely better than cure. The most effective security measures are often those that prevent criminals from deciding that your property would make a good target in the first place. 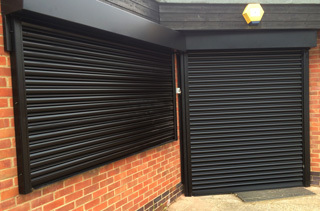 Roller shutters provide a very visible and imposing security measure, and this makes them a powerful deterrent. Looking at your premises without shutters, a thief might think about whether it would be worth trying to smash the window, force the door, or pick a lock. If they see they have the difficulty of getting through shutters beforehand, they will probably just think it is not worth bothering with. They will most likely not be able to get through, and if they can it will require hanging around for a long time which seriously increases the risk of being discovered. 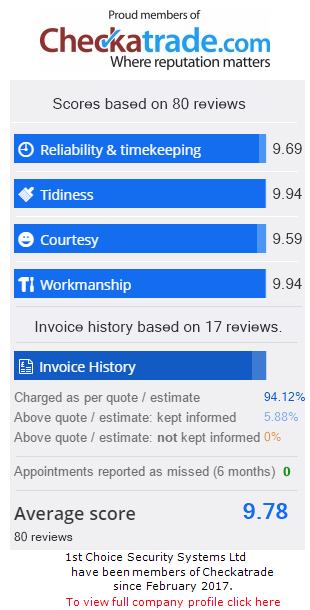 Click here to find out how 1st Choice Security Systems can be Number 1 choice for Roller Shutters.